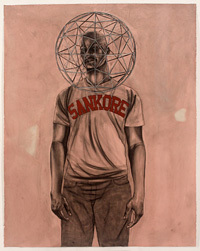 Born in Houston in 1975, Robert A. Pruitt received a BA in Studio Art from Texas Southern University (2000); an MFA from the University of Texas (2003) and has participated in residencies at Skowhegan; ArtPace, Fabric Workshop and Brandywine Printshop. He has received the Louis Comfort Tiffany Award; the Artadia Award; a project grant from Creative Capital and has had a solo exhibition at the Studio Museum in Harlem (2013). 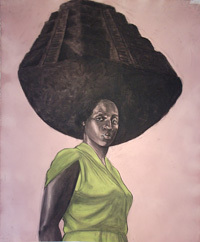 His work has been included in group exhibitions at the Museum of Fine Arts Houston; Contemporary Arts Museum Houston; Dallas Museum of Art; Bronx Museum of Art and the Whitney Museum of American Art. 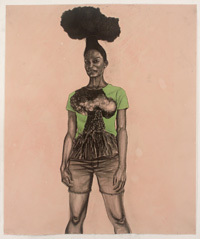 Pruitt works in a variety of materials but his practice is chiefly centered on rendering portraits that suggest a diverse and radical black experience and future. In addition to his solo practice, Pruitt also works collaboratively. He is a founding member of a Otabenga Jones & Associates; MF Problem (with Autumn Knight); and of a loose collective of Houston artists that sometimes works under the name STACKS. The 2013 jury consisted of Naomi Beckwith, Curator, Museum of Contemporary Art Chicago; Cesar Garcia, Director and Chief Curator, The Mistake Room, Los Angeles; Rachel Lachowicz, artist and Franklin Sirmans, Chief Curator of Contemporary Art, Los Angeles County Museum of Art.